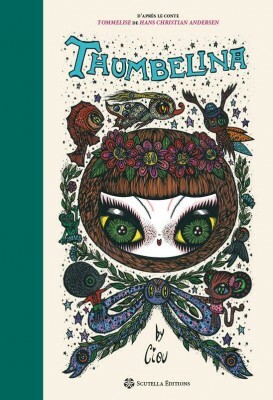 Thumbelina, illustrated book by Ciou and Scutella edition,book in English and french, 72 pages, beautiful edition with green fabric, released January 28th, Scutella edition FR. This version of Thumbelina turns out to be completely new and original, complex and thrilling : it combines contemporary art with nineteenth-century magical extravaganza in an illustrated, bilingual edition of Andersen’s text, bringing two authors, two worlds and two periods together, although they are separated by almost two centuries. Release of Thumbelina, January 28th 2016 at the iNternational Festival of Comics ANGOULEME, i will sign the book during the festival, also the original artworks will be on view during the festival too. « Salon du Livre » Paris signing March 19th- 20th , Scutella booth F23, signing hour 10h-16h. Release in French bookstore 1st April . First bookstore signing Terres de Légendes, date 30th April, Toulouse FR . April 2016, TOKYO group show at Vanilla Gallery, curated by Beautiful Bizzarre Magazine, I will be at the opening, first time in Tokyo. May 2016, Solo Show, » A Journey into Fantasy » Kochxbos Gallery Amsterdam, opening May 7th more info soon.